The elation, which occurs when the three cherries or whatever appear on the winning line of the one armed bandit, can become a little muted when you realise that what is pouring out is merely tokens. You are now more or less tied to spending your winnings in the pub or else putting it back into the machine. Those who win, however, might be advised to keep the odd token for, at some future date, it might just become a collector's item. Admittedly it doesn't seem at all likely, but then who can tell? Certainly, pub 'tokens' from an earlier era are now extremely rare and sought after by specialist collectors. Middle Obverse - W. Shaw Abbey Tavern Old Lenton Reverse Made by T. Pope Birmingham 3d. 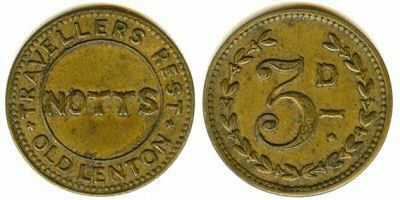 Sometimes known as tavern tokens, but more correctly referred to as public house checks, they resembled coins and, although there was some variation, most were about the size of a five pence piece. The landlord of a pub would have them minted and the check would bear the pub's name, usually the landlord's name or initials and occasionally some sort of pictorial motif. Each would show a value, which ranged between 1d. and 6d., but usually was either 3d. or 1d. 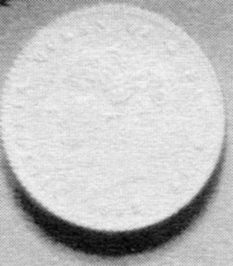 First minted in the mid to late 1840s these pub checks continued to be manufactured until the time of the First World War. Publicans would use their checks in a variety of ways. One use was as a facility check. In order to attract patrons pubs would install billiard tables, skittle alleys or even layout bowling greens, but to ensure that these attractions led to improved sales, the landlord often required proof of purchase before the billiard table or whatever could be used. This was where the check fitted in. Along with the drink, the landlord would give out a check or sometimes the patron was required to pay a little extra on top of the price of the beer. Either way the patron kept the check until it was his turn when he would surrender the check and begin his game. The check was also used in connection with 'wet' rents. Public houses were often the main meeting places for a wide variety of local clubs and societies. A special room might be set aside for a meeting and, rather than ask for rent, the landlord would sometimes request that the members of the club guarantee to drink a certain number of pints. The club would ensure this by purchasing from the landlord sufficient checks to meet the required amount. At the meeting these would then be sold to the club members. In the course of the evening the members would exchange the checks for pints. Any checks left over could be used at a later date - the landlord wouldn't really mind as he had already received his money. In some cases where an employer also owned a pub, it made good business sense to pay some small part of an employee's wages in pub checks. The worker used the checks in the employer's pub and then usually parted with his own money later in the evening. Although the manufacture of the checks had largely ceased by the First World War, their use in some pubs carried on for quite a long time afterwards. If any reader can recall them being used we should be delighted to hear from them. Someone else who would be interested is Grenville Chamberlain who, for the past nine years, has been collecting checks from Nottinghamshire pubs and researching their history. He has recorded checks from 212 different pubs in the County and personally possesses examples from about 140 of them. A number of these checks were used in Lenton pubs. In fact of the entire 212 it is a Lenton check which he considers to be the earliest datable check in Nottinghamshire. There is no date on the check from the New Inn, which once stood on Willoughby Street, but the address of the check's manufacturer is almost as good. T. Pope & Co. are stated to be at 36, St. Paul's Square Birmingham. As they were at this address only between late 1850 and 1851 it gives a very limited period in which the check could have been manufactured. Pub checks must have caught on quickly in Lenton for there are at least two other pubs which used them early on. A Mr. Freudenthal, a Victorian gentleman who collected checks from all over the country, donated his collection to the British Museum in 1910. In this collection are three for Lenton pubs, The New Inn, The White Hart on Gregory Street and the Abbey Tavern (now The Johnson Arms) on Abbey Street. Grenville has examples of The New Inn and White Hart checks, but the only known check from The Abbey Tavern is that in the British Museum. Grenville's most recent acquisition is from a Lenton pub - The Traveller's Rest on Commercial Street. Most of Grenville's checks come from dealers or fellow collectors. Every so often a new check will turn up, having been discovered in someone's drawer or button box. All the local and many of the national dealers know of Grenville's interest and contact him straight away. He has a gentleman's agreement with them that he will give £5 for any Nottinghamshire pub check whether he already has it or not. This sum is not so much an indication of the check's market value, but more an assurance that no dealer need come unstuck if they buy it with Grenville in mind. This offer is made to any member of the public who comes across a local pub check. Grenville has one other pub check which he thinks may well be from a Lenton hostelry. It bears the name The Albion Inn, the face and name of Queen Victoria and the date 1862 but no other details. The Albion Tavern/Hotel was on Park Road and may well have also been known as The Albion Inn. The circumstances under which Grenville obtained the check would indicate that the source might be Lenton, but he cannot be sure. If any reader can help, he would be most grateful. In fact, if anyone has recollections of these checks, or knows the whereabouts of any, he would be most interested to hear from them. 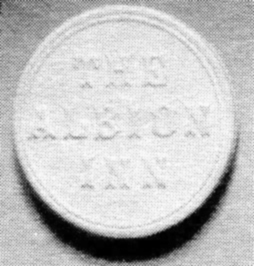 In June 2006, a 19th Century pub check token from The Traveller's Rest, Old Lenton, appeared for sale on Ebay. I am grateful to the seller, Mr Cobwright of Beeston, Nottingham, for allowing us to reproduce the photograph (left).